These days, we often hear the abbreviation IoT, which refers to the Internet of Things. For me, the abbreviation triggered the term “Interference of Things”. We live in an age of ever growing numbers of electronic devices, that all have one thing in common: they need power and thus can be the source of unwanted emissions. Not only because of power electronics, but also because many of these devices communicate wireless. A key problem is that we not only live in an electronic age, but also in a time where only money counts. Companies are struggling to get positive P&L figures, because competition is driving prices down and the obvious response is to sacrifice everything that is deemed not to be important. The most annoying aspect however, is that the unwanted emissions are not at all necessary. 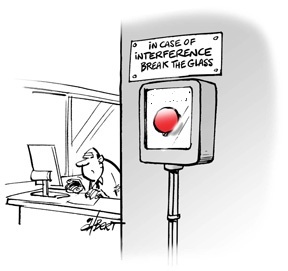 It only takes a proper design to suppress most interference. There is no room for a balance of interests. With a handful of parts, most electronics will be free of harmful radiation. One would wish that car manufacturers could construct emission-free cars with so little effort! The current limits can hardly be seen as limits. In previous posts, I explained that in situations with emission levels near the limit, serious interference will occur. Most amateur radio operators will experience interference, varying from “just a bit” if you are lucky, to “pull the plug” levels that force amateurs to search for alternatives, like remote controlled stations. Especially in densely populated areas, the problem is substantial. European member states should protect their citizens, but the truth is that nothing is done. Many governments are basically just protecting the industry and those who need it, are not at all protected. My legal textbooks state that protecting the interests of weak groups is one of the key elements in a democratic society. One only has to observe everyday life to see that the theory does not apply. In The Netherlands, radio regulator Agentschap Telecom published a document (Dutch) that illustrates the situation. If an amateur receives an interfering signal in a worst case scenario (near the limit), one should expect S9 interference. The document states: “(…) an environment without interference does no longer exist. You have to understand that there is (in most cases) no legal protection. The only remaining option is to mitigate the situation yourself. (…)”. This is in stark contrast with the European directive that “(…) member states should protect radiocommunications, including the amateur service, against interference (…).“. This is why we should not accept this rubbish from our governments. It is likely that the situation in other countries will not differ much. Another threat are short range devices (SRD’s). A EU decision allows SRD’s for “inductive applications” to generate 20 dBuA/m at 10 metres distance, on frequencies anywhere between 5 and 30 MHz. A simple calculation reveals that a SRD will cause notable interference. On 5 MHz, for example, this level would generate roughly -60 dBm at our receiver. My background noise level is about -80 to -85 dBm (higher than ITU “residential” levels), equal to S7 on the S-meter. Interference levels at -60 dBm equate to S9+10 on the S-meter! (Recommend the linked site, with a number of online calculators). Even if the device is more than 10 metres away, you will hear it, because the field strength drops 6 dB for twice the distance. At 80 metres, the level would be around the receiver noise level (and still detectable). On quiet days, my lowest noise levels are around S4, so about -100 dBm, in which case SRD’s up to hundreds of metres would cause interference. Some may argue that radio amateurs are just hobbyists that simply have to accept spectrum pollution (as our administration states!). But not only radio amateurs are victim of the lack of legislation, other spectrum users will experience degradation of radio services, including vital services. Reliability will degrade, with inevitable consequences. Public interests are at stake, not just a bunch of weird hobbyists! The IoT also has a notable negative economic effect. Mobile networks have to increase power levels or use smaller cells. This will impact the integral cost of ownership. I expect that the spectral efficiency will degrade, because if operators have to plan their networks with increased target field strengths, the neighbouring cells will suffer more interference and that requires wider spacing of cells (using the same frequencies). At the end of the day, the industry may think that money can be saved by less strict EMC design, but that is a false promise, as others will get the bill. It resembles many cases of environmental pollution, we think to save money by throwing away waste, but cleaning up will be far more costly than the initial saving. Taking the problem away will take tens of years. Even if limits would be reduced today, it will last long before the lifetime of the vast amount of electronic devices has expired. Measurements of interference levels and to check if devices are compliant. If not, products should be withdrawn by producers. The industry should become more aware of any problems. It is known for example, that many PV inverters do no comply, but what is happening? I doubt if anything is done. Many amateurs have jobs in the industry. They can influence design and application of products. But do they? Or rather listen to the boss who is only interested in $$$? We could publish lists of good and bad products. I know that some amateurs are already doing this, but our societies could help to get more publicity. Publish more in amateur radio magazines. Stimulate awareness and show results. That will trigger amateurs to get out of the operating chair and assist with whatever they can. IARU member societies should coordinate efforts to reduce overlap and improve effectiveness. Share knowledge, identify opportunities and agree who should do what. Bring severe cases of interference to consumer TV programmes and explain that for us, radio interference is just as bad as sound noise from your neighbours. The only difference is that most people will not notice. In these programmes, one could also point out that interference can have serious impact on functioning of vital communications. Many cases are known of digital radio or TV reception that is disturbed of even completely stops when LED lights are switched on, for example. Legal research: seeking possibilities to enforce the key EU directive, that member states “…should protect radiocommunications, including the amateur service, against interference…”. At this moment, I am studying options to see if a formal complaint may lead the way to a court case. If a court decision would be in favour of the amateur service, this could be a major step forward. Whether or not amateurs should be represented in regulatory bodies. For example, if we take part in a body that proposes bad limits, it could be suggested that we agreed. In such a case, it is better to stay away. It will be a waste of time. In January, I submitted a proposal to our regional chapter of the VERON (one of the amateur radio societies). The proposal is about strengthening the efforts with respect to EMC and to take initiatives and to define policies. Saturday April 22nd 2017, the proposal was discussed during the national assembly of VERON. It was accepted unanimously. Consensus was that EMC should have priority. On the VERON website, the board responded: “The proposal was accepted and strengthens the priority that the board puts on EMC.”. For me, this remark was very disappointing. It suggests that the VERON sees EMC as “business as usual”. How on earth will amateurs be triggered to take action? Without action, amateur radio will become extinct, especially in densely populated countries like PA-land.